Includes Doniphan, Atchison, Jefferson, Leavenworth, Wyandotte, Douglas, Johnson, Franklin and Miami Counties. Includes Marshall, Nemaha, Brown, Riley, Pottawatomie, Jackson, Geary, Wabonsee, Shawnee, Morris, Chase, Lyon and Osage Counties. Includes Jewell, Republic, Washington, Mitchell, Cloud, Clay, Lincoln, Ottawa, Ellsworth, Saline, Dickinson, Rice, McPherson and Marion Counties. Includes Cheyanne, Rawlins, Decatur, Norton, Phillips, Smith, Sherman, Thomas, Sheridan, Graham, Rooks, Osborne, Wallace, Logan, Grove, Trego, Ellis, and Russell Counties. 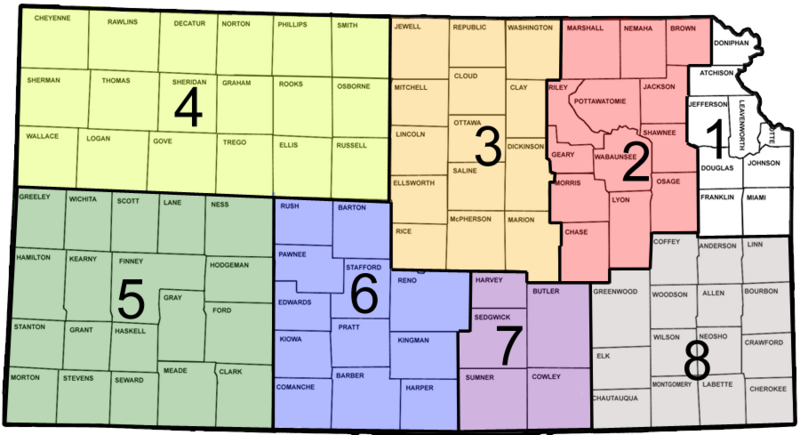 Includes Greeley, Wichita, Scott, Lane, Ness, Hamilton, Kearney, Finney, Hodgeman, Stanton, Grant, Haskell, Grey, Ford, Morton, Stevens, Seward, Meade, and Clark Counties. 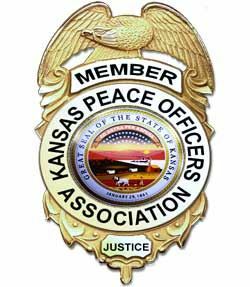 ncludes Rush, Barton, Pawnee, Stafford, Reno, Edwards, Kiowa Pratt, Kingman, Comanche, Barber and Harper Counties in Kansas. Includes Harvey, Sedgwick, Butler, Sumner and Cowley Counties in Kansas. Includes Greenwood, Coffey, Anderson, Linn, Woodson, Allen, Bourbon, Elk, Wilson, Neosho, Crawford, Chautauqua, Montgomery, Labette, and Cherokee Counties in Kansas.